Dot-a-Pix are an advanced adaptation of the classic dot-to-dot puzzles which provide high quality pictures when solved. Starting with dozens and going up to several hundreds of dots, Dot-a-Pix puzzles create beautiful detailed pictures and provide the satisfaction as if you drew them yourself. 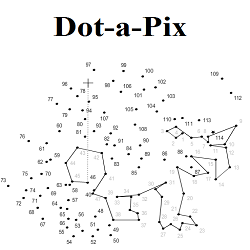 Dot-a-Pix is a number-connecting puzzle solved in the traditional way of connecting dots in ascending order until the hidden picture is completely exposed. Dot-a-Pix puzzles come in B &W and color, and are available in many sizes both in single line and multi line variants.